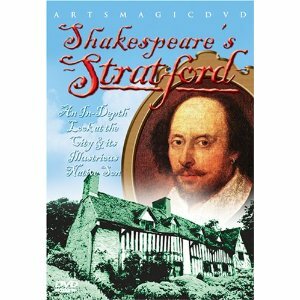 This video takes us to various locations all around Stratford, including properties owned by the Shakespeare birthplace trust. We tour the birthplace. We see his mom Mary Arden’s home (which it turns out was misidentified with a neighboring house for years and the actual Arden home was saved by chance). We see his wife Anne Hathaway’s cottage with its cozy-looking thatched roof. His daughter Suzanna’s house. His granddaughter’s house. The school he went to. The church where he was baptised and buried. Along the way, we hear the stories of each place told by the people who work there. It’s fun. It’s informative. Okay, I will admit to having a nearly superhuman tolerance for historic home tours. Seriously, I have walked through hundreds of houses. I like it. I like looking at the old furniture, hearing the old stories, wondering what it was like way back when. And… I’ve visited Stratford and been to most of the places featured in the show (over 20 years ago, but still). I would go again. I don’t get tired of the whole thing. Yet there’s something oddly off about this show. It’s very low budget. I think I could have filmed it. It looks like it was made all in one day — a really windy, gray, ugly winter day. The audio is often bad, especially on the docents and people being interviewed. The host, Stratford native Sue Sutton, is an odd duck. Poor thing, she is forever windblown. She really could have used a stylist (or at least a comb through her hair). Sutton purposely asks unusual questions at nearly every location. It was sort of like taking my 9-year-old son on the tour and hearing him ask cringe-worthy toilet-related questions and then giggle as the tour guides deal neatly with the queries they’ve probably heard a zillion times. For example, Sutton gets into an extended discussion of Shakespeare’s son-in-law’s hemorrhoids. We hear about the purges (both upward and downward) that doctors prescribed back then. We hear how the privy slosh got poured on the gardens as fertilizer. And now I know why there were canopies on beds (to keep bugs, rat droppings, etc. from falling from the organically active thatched roof into the open mouths of snoring sleepers!). It goes on in that vein. There’s a lovely explanation of the clothing worn by various members of a well-to-do sixteenth century farming household. And then Sutton asks a costumed reenactor to explain the mechanics of the codpiece on his pants. We learn that scientists identified the year that the timbers were felled for the Hathaway cottage (1460something) and then we hear how cow dung was essential in its wattle and daub construction. And finally (by then, not surprisingly! ), Sue Sutton tells us she was named for Shakespeare’s daughter Suzanna, because like her, she was conceived several months before her parents married (when her father, an RSC actor, saw a ghost of William Shakespeare). Alrighty. Worth my while? Yeah, I liked it. Except now I feel cold. Worth your while? Maybe, maybe not. She cracked me up. What a mess. But really, the video is nice to watch. Thanks! Happy New Year! Yes, I never intended to do “Shakespeare in a Year,” but my pace is a bit slow, isn’t it? Oh well, maybe I will find more reading/blogging time soon!